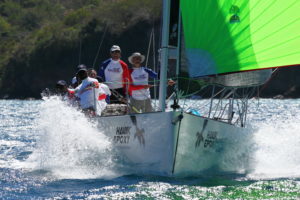 My 2019 racing season started in late January on the Eastern Caribbean island of Grenada, where I helped a local team of Grenadians race their home built Carib 33. Grenada is about the only Caribbean island I had never been to, so I was keen to go when I got the call from my buddy Nacho. It was also an opportunity to help a local team sail. Although we are surrounded here in the islands by the best sailing in the world, our local people rarely get involved in the water and boating, so any opportunity to help promote this is welcome. I had a super time, helped them win the regatta, and finally got to see and enjoy the “spice” island of the Caribbean. Nice way to start the year. Next up was the St. Barths Bucket in March, about as extreme a contrast as you could get to the regatta in Grenada. This one is on monster yachts all over 100ft. I was tactician on the 54 meter Hyperion and we sailed a good regatta and most important, had a great time on St. Barths. We were 3 boats tied going into the final race when our genoa split in half, forcing us to limp around the course. But we held on to third for the event, and the owners were pleased, so all was ok.
Next up for me is a series of events and training in Europe. I will be heading over in April and will base myself on the Spanish island of Menorca on my Outremer 45 catamaran. This year I have scheduled some breaks in between my regattas so I plan to take a few trips around Europe and finally get to enjoy sailing the cat. Here’s to a great year of work, play, and enjoying life to the fullest.